When South Africa’s President Jacob Zuma visited Nigeria last week he was on a delicate mission to mend rifts between the continent’s two economic powerhouses. From economic rivalry to political friction, relations between South Africa and Nigeria have been strained in recent years. The election of Nigeria’s President Muhammadu Buhari into office last May did not immediately ease the tension. When Zuma visited Abuja last week, Buhari set aside diplomacy and accused one of South Africa’s largest companies of failing the country in its fight against the Boko Haram insurgency. Telecoms giant MTN was fined $3.9 billion for missing a deadline to disconnect 5.1 million unregistered SIM cards, a legal requirement aimed at hampering the militant Islamists. Buhari said MTN was “very slow” in cutting off the lines and that the unregistered lines were used by “terrorists” and “contributed to the casualties”. The Nigerian government’s concern “was basically on the security, not the fine imposed on the MTN,” he said. But MTN is not the only South African company riding rough waves in Nigeria. Hotel and resort chain group Sun International is also a target of investigation by the country’s economic financial crimes commission. “We have an exemplary track record of operating in many countries over the past 30 years, but the difficulties we have experienced in Nigeria are unprecedented,” Michael Farr, Sun International group’s general manager for communications, told AFP. Africa’s largest satellite broadcaster, Johannesburg-headquartered Multichoice, last year came under pressure to reduce its tariffs following accusations by the Nigerian authorities that it was abusing its dominant position. Some South African companies, such as the Truworths clothing retailer, have pulled out of the country altogether. “We closed our four stores in Nigeria because we were unable to send stock to stores due to the regulations in Nigeria,” Michael Mark, Truworths CEO told AFP. Following the rebasing of its gross domestic product figures in April 2014, Nigeria became the continent’s largest economy, overtaking South Africa. While 120 South African companies operate in Nigeria, the west African nation is only Pretoria’s seventh-biggest trading partner on the continent. “Some South African business people and officials suspect that South African companies are being targeted because of envy from local competitors,” said Peter Fabricius, an analyst with the Institute of Security Studies in Pretoria. But “many Nigerians believe (MTN) was grossly negligent about obeying the rules and arrogant,” said Fabricius. Muda Yussuf, the director general of Lagos Chamber of Commerce and Industry said that it “does not mean these companies are being targeted”. “It is just that companies operating anywhere have to comply with the laws governing business behaviours in their host countries. It does not matter if the companies are from South Africa or somewhere else. After signing more than 30 bilateral agreements on trade, energy, defence and security among others, Pretoria put a positive spin on the visit. 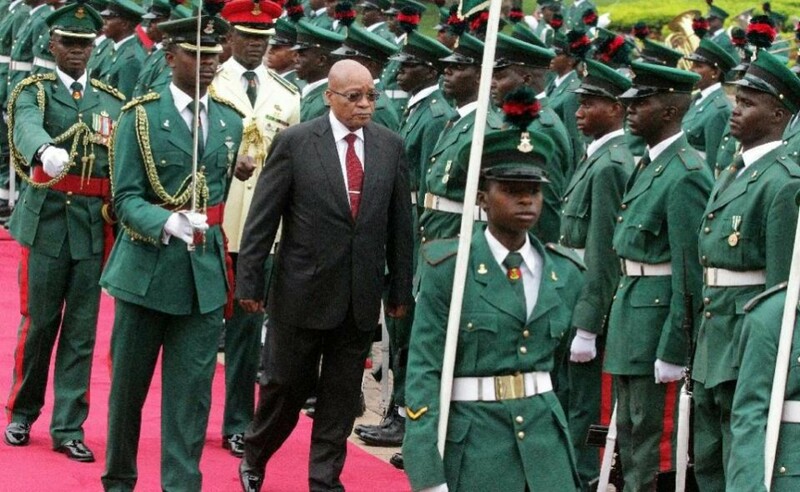 “The visit of Zuma… is a testimony that there is no undercurrent of ‘cold war’ between Nigeria and South Africa,” said Sola Oni, investment analyst and former senior manager with the Nigeria Stock Exchange. “Nigeria is such a strategic country that cannot be easily ignored by any country globally,” said Oni. But both countries are facing economic headwinds. South Africa’s growth is undermined by the slowdown in China and falling commodity prices, while Nigeria, the continent’s top oil producer, is suffering from low oil prices.